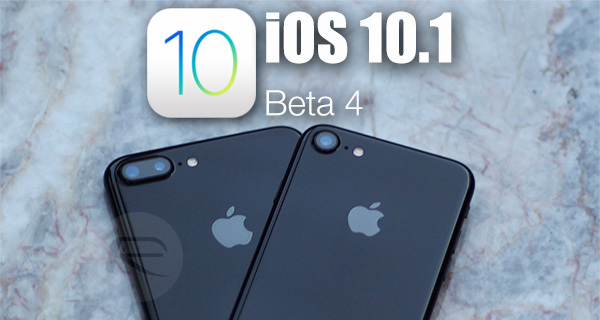 Apple has released iOS 10.1 beta 4 for download to developers and testers, which comes approximately seven days after beta 3 of iOS 10.1 was seeded. This latest beta hits the inboxes of developers and public testers about five weeks after Apple issued the maiden version of iOS 10 to the public, and once again shows the company’s commitment to ensuring that iOS 10 acts as the most seamless environment possible for all iPhone and iPad owners. 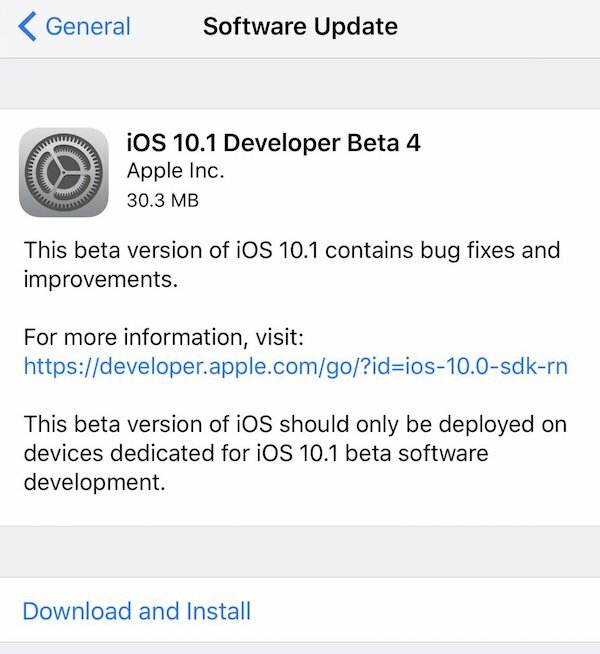 As you might expect, this latest iOS 10.1 beta isn’t one that’s going to immediately introduce a heap of new functionality and outward-facing changes for developers to sink their teeth into. Given the fact that it’s a fourth release in the first major update of sorts to iOS 10, it’s more focused on improving the overall experience and fixing bugs and issues that have previously been reported to Apple, and have either existed since the public launch of iOS 10 /10.0.1, or discovered in additional minor point releases since. However, as we have previously mentioned, Apple has taken one fairly giant leap with iOS 10.1 by introducing the new Portrait mode feature specifically for the iPhone 7 Plus. As discussed during the company’s iPhone-centric September 7 event, the new Portrait mode is essentially a software integration that unlocks the full potential of the dual-lens camera system in the iPhone 7 Plus. In addition to having fantastic zoom capabilities that uses the telephoto lens, iPhone 7 Plus owners, as of iOS 10.1, will also be able to capture stunning images with blurred depth-of-field effects, akin to the type of images that you can take using a DSLR camera. We all know by now that Apple doesn’t necessarily like to issue granular changelog or release notes alongside a developer-facing beta, but we can deduce that part of iOS 10.1 beta 4 contains improvements to the new Portrait mode beta that should hopefully get the feature ready for a final release for all of those current and new iPhone 7 Plus owners out there. If anything new becomes available, we’ll be sure to update you. As always, this latest iOS 10.1 seed is available to download immediately as an over-the-air update from Settings > General > Software Update for those developers and public testers with either a previous version of iOS 10.1, or configuration profile, installed on the device. The IPSW file can also be downloaded directly through Apple Developer portal for a fresh clean install. Earlier today, Apple also dropped iOS 10.0.3 for iPhone 7 and iPhone 7 Plus users. You can learn about iOS 10.0.3 here: Download iOS 10.0.3 IPSW Links For iPhone 7 And iPhone 7 Plus. Still no “blob” live wallpapers. Why did they show them on the iPhone event and all the pictures on the website but don’t actually have them on the devices?